0 Members and 46 Guests are viewing this topic. Quite a great new find. Hosty confirms that Oswald is Prayer Man. Doyle can rant and rave all he wants but it does not change the evidence one bit. Where is eyewitness testimony, including numerous employees at the TexasSchoolBookDepository Building that were on the landing, as well as on the stairs and on the sidewalk/street just in front of the TSBD Bldg entrance stairs/landing, that places accused LoneGunmanAssassin, LeeHarveyOswald(1939-1963), on said landing during the fatal shooting of USP JohnKennedySr (1917-1963) and critical wounding of TxG JohnConnallyJr(1917-1993)? How could Bldg Superintendent RoyTruly(1907-1985), accompanied by DPD Officer MarrionBaker(1930-2011) have brushed by LeeOswald on the landing without seeing him, especially considering that SuperintendentTruly and OfficerBaker encountered MrOswald on the second floor, at the lunchroom about 60-90 seconds after the shots were fired? Why claim that LeeOswald was on the landing during the assassination/shooting without any of multiple area occupants' testimony/sworn statements' confirming said presence? Why claim that DPD Officer MarrionBaker and Bldg Superintendent RoyTruly did not encounter LeeHarveyOswald at the SecondFloorLunchroom some 60-90 seconds after the shots being fired, despite their testimony/sworn statements' confirming said encounter? Mr Clements, can you provide reliable provable evidence that FBI SA JamesHosty proves/confirms that LeeHarveyOswald is in fact the actual person represented by PrayerPersonImage? PRAYER-MAN-IS-OSWALD ADVOCATE: Prayer Man is Oswald. LONE NUTTER: Are you nuts? Not even Oswald said he went out front! PRAYER-MAN-IS-OSWALD ADVOCATE: There's lots of evidence pointing to the contrary. LONE NUTTER: Are you nuts? There's no evidence to the contrary! LONE NUTTER: You call that evidence? Ha ha ha. Nothing to see here! PRAYER-MAN-IS-OSWALD ADVOCATE: What if we were to find hard evidence that Oswald said he went out front? LONE NUTTER: So you admit you have no hard evidence! Ha ha ha. Try harder! PRAYER-MAN-IS-OSWALD ADVOCATE: Actually, we have just uncovered a note written by Agent James Hosty which states that Oswald said he went out front. LONE NUTTER: Are you nuts? Oswald was a teller of non truths! PRAYER-MAN-IS-OSWALD ADVOCATE: But the Hosty note proves that Captain Fritz and co. lied about what he said in custody. 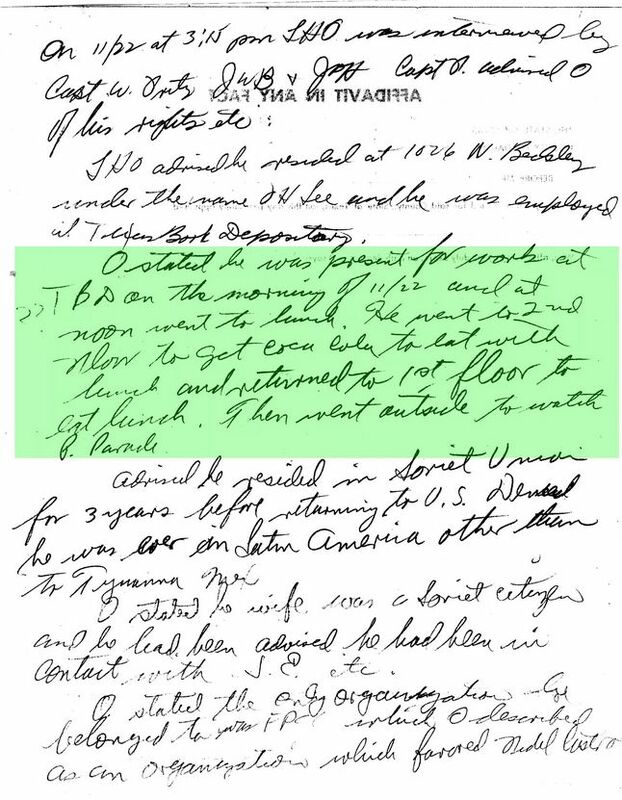 PRAYER-MAN-IS-OSWALD ADVOCATE: But the Hosty note corroborates Carolyn Arnold and Sarah Stanton's sighting of Oswald in the lunchroom before the assassination. LONE NUTTER: Are you nuts? There's absolutely no photographic or film evidence of Oswald in the lunchroom before the assassination. Ha ha ha. Try harder! I tend to wonder, as I do often wander, to whom this Reply is addressed. I tend to assume that "LONE NUTTER" is a reference to those that embrace the LeeHarveyOswald/LoneGunmanAssassinTheory. And, I tend to assume that "PRAYER-MAN-IS-OSWALD ADVOCATE" is a reference to those that embrace the LeeHarveyOswald/PrayerManTheory. For clarification, I have yet to be able to embrace either theory. However, I do believe that there is reliable indicative information as positive evidence that RoyTruly and MarrionBaker did encounter LeeOswald at the SecondFloorLunchRoom about 60-90 seconds after the shooting/fatal wounding of JohnKennedySr and shooting/critical wounding of JohnConnallyJr. B) to have gone out front for the motorcade. Prayer Man advocates discount the sworn testimonies of Marion Baker, Roy Truly and Jeraldean Reid. They have three or four others committing perjury as well. Methinks your use of "zealots" is misdirected. If you want to see a real zealot, look in the mirror. Quite a great new find. Hosty confirms that Oswald is Prayer Man. B) gone out front to watch the motorcade? If not, how do you explain this from Agent Hosty? The highlighted text is not a confirmation of anything. It's already well established (confirmed) that Oswald was a teller of non truths. Hosty was merely recording some of Oswald's lies.